The plan is to explore Montreal in three days, and at first thought this seems reasonable, but little do I know that Montreal is a complex patchwork of tremendously downplayed treasures. We begin in Little Italy with a visit to the Jean-Talon Market (read all about it here), once a lacrosse field and the largest fresh fruit and vegetable market of its kind in North America. And when we’ve had our fill of the prettiest and most mouth-watering produce I’ve ever gazed upon, we take a stroll around one of the city’s most spirited neighbourhoods. Italian deli’s, supermarkets, pastry and coffee shops pepper the streets, but it’s a particular kitchenware store that peeks my interest. Quincaillerie Dante is a peculiar store and one, which I’m sure, will never cease to produce exclamations from new customers and tourists alike. With its shelves chock-full of the finest in cookware and bake-ware, recipe books and fancy gadgets, the store is a nectar for foodies and a chalkboard advertising cookery lessons from its owner Elena Faita and her son Steffano appears appropriate. But as I’m admiring a display of microplanes, the curious corners of my eyes capture the most unusual scene; staring back at the lovely Le Creuset ramekins and Bialetti Moka pots is artillery of hunting guns. Yes, at Quincaillerie Dante you can pick up a juicer, book yourself in for a lesson in pasta making and purchase a hunting rifle, all at the same time. In a gangster film, this set-up might seem illicit, but Quincaillerie Dante is weirdly charming. With award winning chef Normand Laprise at its helm, Toque is probably one of Montreal’s most prized restaurants and certainly looks the part in its 1960s inspired decor. The food is excellent, beautifully presented and wonderfully tasty, but some of the prices on the menu have left me just a teensy bit wanting. The afternoon takes me to the Plateu Mont-Royal brough of Montreal, specifically the Mile End area. Now as a Londoner, ‘Mile End’ immediately conjures up in my mind images of London’s very own Mile-End, and astonishingly Montreal’s historic Mile End is pretty much a reflection of London’s. It’s young, hip, vibrant and confidently multi-lingual, making it a most pleasing and creatively stimulating place to live and work. This neighbourhood has been home to indie band Arcade Fire, acting legend William Shatner and many a writer and artist. It thrives on diversity, an appreciation for its history and a hunger for the avant garde. It is also a melting pot of cuisines and flavours, with decades old restaurants and cafes still holding prominence, whilst the old textile mills and warehouses now converted into trendy independent coffee shops and bars, flourish happily along side. ‘If you’re in the Mile-End, you must eat a Fairmont or St Viateur bagel,’ a suggestion locals will encouragingly offer, along with the proud assertion that Canadian bagels are far superior to New York bagels. I expect a pronounced difference, but my bagel tastes remarkably like a London bagel – more chewy and flavourful than the New York version, but not especially grander. As you might expect, Mile End presents a far more interesting and eclectic shopping experience than Montreal’s central shopping area in Downtown. L’Arterie on Bernard W. houses vintage apparel, shoes and accessories as well as creations from local designers in this neat little shop, whilst Phil’z on Saint-Laurent offers vintage and repro furniture and retro lighting. Phonopolis on Ave. du Parc offers a feast for music lovers, selling the latest hot tunes, an impressive array of vintage and second-hand records and music from local bands. I could happily spend the rest of my stay in this area, exploring the creative scene and checking out the cool boutiques, but it’s just one of the reasons I shall have to return to Montreal. The evening before we fly home, we are huddled into a tiny, sparsely decorated (but for the art on the walls) restaurant, where the tables nearly kiss and conversations are easily entangled. But don’t let the layout and the lack of space at Restaurant Van Horne fool you – this place is a precious gem in a city brimming with foodie treasures. The atmosphere is relaxed, the staff friendly and attentive and my market fresh mackerel main out of this world! We couldn’t possibly pass up the opportunity to enjoy Sunday brunch in Montreal before travelling back to London, so heading back to the Plateau Mont-Royal neighborhood, we anticipated the culinary magic of Bistrot La Fabrique. With La Fabrique’s rustic open kitchen taking centre stage, encircled by hungry customers, the scene is not unlike that in a theatre creating a unique, fun and interactive atmosphere. The extensive menu has me spoilt for choice and after much deliberation I give in to the decadence of French toast, poached quince, pistachio cream and of course maple syrup. The portions are generous and the flavours sublime – a fitting final feast before a long plane food fuelled flight home. The city of Montreal is a veiled wonderland, sharing its prizes with only those who actively seek its bounties. And what delicious bounties it has to bestow. 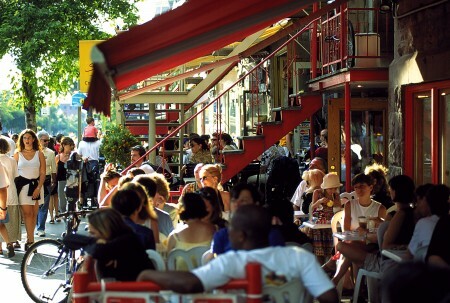 Montreal is more than just the gastronomic delights it has to offer, but if you’re planning a stay in this multi-faceted, cosmopolitan, multi-cultural city, indulging your palate is not just worthwhile, but an unavoidable adventure. Great job! I write actively and describe well, not lingering too long. It is full of good and pertinent information. Thanks for a fun read.